Gaithersburg, Maryland, USA - November 07, 2014 - GL Communications Inc., announced today its latest product High-Density Call Generator for IP and Wireless Networks - referred to as MAPS™ HD (Message Automation and Protocol Simulation High Density). Speaking to reporters, Mr. Jagdish Vadalia, a Senior Manager for Product Development of the company said, “MAPS™ is GL’s standard framework for emulation of IP, TDM, and Wireless protocols. The HD version is a special purpose 1U hardware platform capable of high call intensity (hundreds of calls/sec) and high volume of sustained calls (tens of thousands of simultaneous calls/1U platform). Multiple 1U platforms can generate and sustain 100,000 to 200,000 calls all controlled from a single Master Controller. 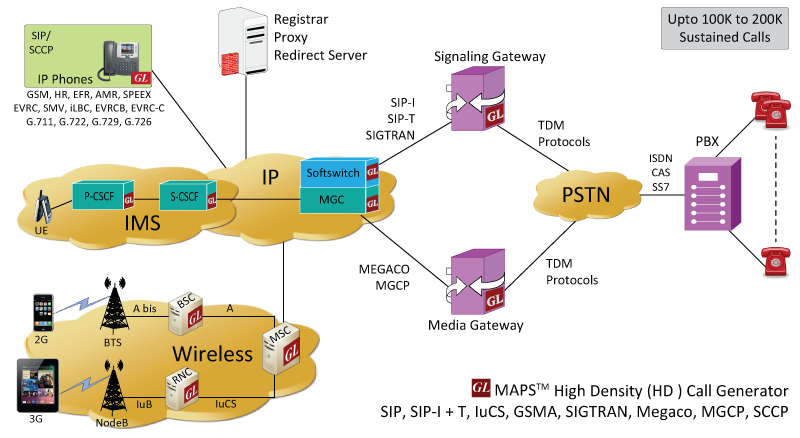 He added, “GL’s MAPS™ HD is a high density multi-protocol, multi-technology network appliance that performs signaling and traffic generation for a vast array of communication protocols covering IP and Wireless networks. It supports simulation of SIP UA, IMS SIP UE, SIP I+T, SIGTRAN, IuCS, MGCP, NCS, H.248/Megaco, Cisco SCCP (Skinny), Clear Channel (No Call Control) and provides non-reference-based voice quality using E-model (R-factor) and MOS with five mapping scales. Mr. Vadalia further added, “Through MAPS™ inherent scripting architecture, end-to-end testing of complex networks like Next Generation Voice Networks, Unified Communications, and IMS & Contact Centers is possible. The network appliance can simulate a complete protocol state machine and offers ‘syntax-ready commands’ to easily build scripts. It provides ready-to-run scripts for simulating important call scenarios or procedures. Its syntax-ready commands in script reduce the dependency on technically skilled resources and its re-usability of scripts, messages and profiles reduces ‘time-to-market’. Customized test scenarios can be defined to build valid or invalid test cases.